Everyone else is doing it, so why shouldn't I? Now that the Summer season of dramas has ended, it is time to look forward to Fall's upcoming dramas...or so I thought. It looks like it's going to be a very disappointing Fall. So, let's take a look at some of the dramas lined up for us, shall we? It looks like everyone and their mammas are solving mysteries this season...so watch out, Kindaichi (松潤バージョン) . Who? 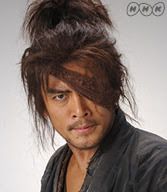 Some dude I've never heard of, in some dramas I've never watched. And Shibasaki Kou, a singer/actress, I enjoy some of her music and have seen some of her dramas and movies - Orange Days, Good Luck!, 世界の中心で愛をさけぶ and Battle Royale. What's it about: An extremely smart man (Masaharu), who is nicknamed Galileo (clever), who solves mysteries no one else can with the help of his hotheaded rookie cop (Kou). Who? Nakama Yukie has been in a bunch of things and I love her! She's hillarious! But also a really talented actress. She's probably most notable for her role in the Trick series. She was also in Shinobi...which was popular. What's it about: SUPRISE! Solving crime. Nakama plays a rookie cop, whose only talent is being an excellent shot, paired with a veteran cop with a #1 arrest record, the two must work together to fight crime. Rating - I like Nakama. So, I'd watch it. Despite it being a cop drama. What I really mean - I'll probably get half way through, find something shiny on my floor and get distracted. What it's about: It's based off the manga by Anno Moyoko, about Kanno who is an editor of a weekly magazine and is so focused on her career she has no time for her personal life, let alone romance. Her co-workers call her "hataraki-man" (working man). Rating - Hmmm. Eh. I used to read the manga and got bored and feel the drama would do the same. If they want to make an Anno Moyoko manga based drama, make 花とみつばち. Good stuff. Read it! Who? Kitagawa was Sailor Mars in the Sailor Moon live action series. Tanihara is in Fuurin Kazan 風林火山, which hopefully everyone checked that out as well. What's it about: Reminds me of Pushing Daisies Super Happy Japanese REMIX 2. I dunno. Kitagawa works for a funeral services company. Oh, she also carries around a mop and mops up around dead people. Whenever she comes across a corpse of someone who leaves strong feelings after their death she travels back in time to try to save them. Rating: Crazy. I'd watch it. Better than some of the other ones. Actually, it looked like it was the best on the line up, which is sad. What I want to know - Does her mop have special powers? 'Cause if it does. That's awesome. Also, I think it should talk. A talking magical mop. Cool. *These are just some of the dramas. There are plenty more, but none worth mentioning. You can find more here if you're so inclined. What wonderful treasure do I have for you this week? Love it. Watch it. Roadshow. 10/27! Bring the Osaka nightlife to you. With rivaling hostesses, dramatic nightlife, politicians, yakuza, the underworld, and a story that centers around a girl who is bent on revenge, no wonder I'm addicted to 女帝 Jotei. Ayaka, our hero, seeks revenge on those who wronged her and vows to become 女帝 "empress" of the Osaka night scene...and is willing do anything in order to succeed. 女帝 started in July and just ended last week. I, however, just started watching it because I am behind on my drama madness! School+internship = bum kicking. NO TIME! BUT NEVER FEAR! I will make TIME for 女帝, because I want to know what happens! I want to see the revenge in action! If you watch the first episode you will be as outraged as much as I was! And if you are like me...you speak (ahem) *yell* at the screen...in a plethora of emotions...and scare the roommates in the other room. How colorful I am. Also ナナムジカ does the theme song 彼方. Which, because I love you, I have put here for your listening/viewing pleasure. I know. I'm awesome. You can learn more about 女帝 by visiting TV Asahi's official site and download it either by torrent from d-addicts or visit crunchyroll to get your fix. They let Gackt be in a drama?! Gackt's picture...he looks so out of place! So let's play a game! 答え！Alright you had 5 pictures to choose from. If you chose #1, you are wrong. That is the main character 大林勘助 Obayashi Kansuke...why is he wearing a cloth over one eye?! BECAUSE HE DOESN'T WANT TO SEE GACKT IN HIS PERIPHERAL! If you guessed #2, you are right! おめでとう...I guess. You win nothing! Yay! (claps vigorously). 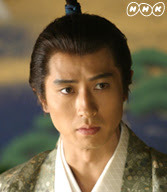 #3 is 上杉謙信 Gackt's same character from the TV Asashi version of Fuurin Kazan. Something seems...off. I mean really...what happened there?! They are supposed to be depicting the SAME guy! (sigh) If you picked #4 (sighs again) shame on you. 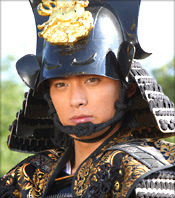 And #5 is 今川義元 Imagawa Yoshimoto. *You can navigate around the map and look at the other characters and story plot on 風林火山 NHK's official site. Now if you still don't see why Gackt doesn't fit in...then...you have problems my friend. Plus he can't act. Here is a sample. This then reminds me of the time he was in concert and fell off the stage. I like to play it over and over. And over and over again. Ha. But seriously folks, all laughter aside, besides Gackt and his "creepy", 風林火山 Fuurin Kazan is actually a very good drama. I'm usually not into period dramas, but 風林火山 is very addicting. You can watch it via torrent from d-addicts or it airs on KTSF 26 on Saturday nights. *Oh and a side note to all the girls out there who think that they have a chance with Gackt-he's taken by his violinist...who is a boy. 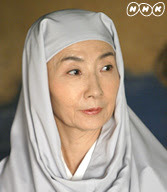 My dramatic blog about Japanese dramas. No subtitles needed folks, Universal Translation: Pudding. Some rather lovely blogs I found. The next blog I came across, I guess I didn't really COME ACROSS it, I was looking for it, was Goddess Carlie [dot] com. Her site is really interesting. It has some information on her favorite Japanese dramas, including Hana Kimi (which I have yet to see, but is basically about a girl who moves from the U.S. to stalk this boy she idolizes and wants desperately to go to school with him, but OH NO! He goes to an ALL BOYS SCHOOL! So she becomes a cross-dresser and dresses up as a boy and infiltrates the school and pretends to be a boy! And no one no one is the wiser. Oh the hilarity and drama that ensue...or so I assume, like I said I haven't seen it yet...but I can assure you...."hilarity" "drama" "romance" "ensuing"...aren't Japanese dramas fun). ANYWAY once again - digression- Carlie's site is really fun, it not only has information on dramas, but has fun little snippets of random videos and some fun music videos. I recommend the Orange Range one, that's on the main page "Ikenai Taiyou" makes me laugh, I don't know why. Easy to navigate, fun information and all around fun site...I enjoy it and she too enjoys the Matsujun. What is the Matsujun you ask? And finally the last one I picked because it was actually done on blogger and done exceptionally well. It is a Nodame Cantabile (an extremely popular Japanese drama and manga) blog. It was actually done in my site layout too! Except hers is really, really pretty and nice. She has posted all sorts of information about the drama and some about the manga and she even put up some music from the OST, which I am actually listening to while I am posting this, quite nice. She also has some really nice resources, playlists and helpful links. I really encourage everyone to take a look at it even if you aren't interested in Nodame, even though it's a great show, and I will probably talk about it on my blog later on, just to check out her layout and organization so you can get ideas and everything. Okay, I think this is all for now. CHECK OUT THOSE BLOGS. jya ne- bye bye!